Digits 1-9 are everything when it comes to solving the Samurai Sudoku puzzles. 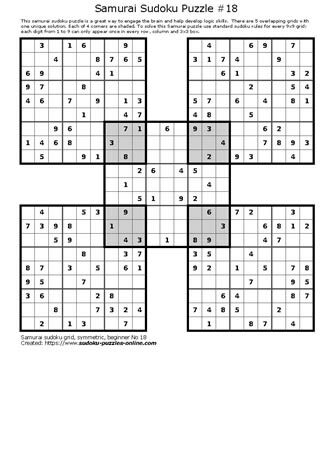 Using the basic rules of Sudoku, along with logical reasoning, these extreme forms of math related brain teasers are sure to provide hours of fun and challenge. Download, print and solve with family and friends. Or, offer to challenge them to see who can be the first one to find the unique solution to this fiendish logic puzzle.